Due to popular demand and the fact that we love trying weird foods and candies, The A.V. Club will now regularly feature “Taste Tests.” Feel free to suggest disgusting and/or delicious new edibles for future installments: E-mail us at tastetest@theonion.com. Long ago, in the Precambrian Era of The A.V. Club, back in 2007 when Josh Modell hadn’t finished evolving from a giant ground sloth and the comment boards were slate blocks upon which readers carved “First!” with sharpened trilobite shells, we launched this Taste Test feature as a blog entry about Vosges’ “Mo’s Bacon Bar,"a combination of “applewood smoked bacon, Alder wood smoked salt, and deep milk chocolate.” Some tasters liked it, some didn’t, but all were pretty intrigued by the then-novel combination of bacon and chocolate. We now refer to this as The Before-Time. But we here at the A.V. Club Taste Test labs haven’t seen much sign of that. We’re still getting inundated with bacon-related taste-test requests from readers, and product pitches from manufacturers. Recently, we realized that we had the opportunity to do a double trifecta: not merely three more bacon products, but specifically, three more bacon products that duplicated products we’d already tasted in the past. 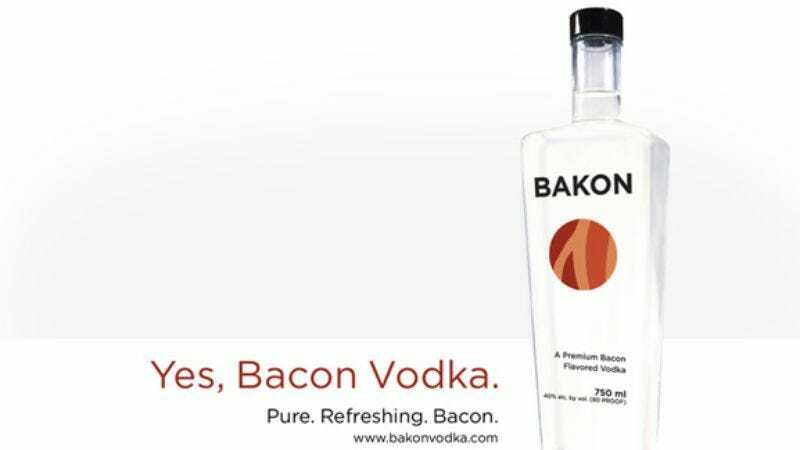 The question was, would a subsequent brand of bacon-covered chocolate, bacon salt, or bacon vodka be better than the ones we’d already sampled? Leading the charge: Genevieve personally contacted the business manager of Black Rock Spirits to ask for a bottle of Bakon, “a premium bacon flavored vodka” that hit shelves in Seattle a few weeks ago and will be more widely available starting in July. Supposedly she didn’t do this solely because she’s a big ol’ lush who likes being sent free booze; as the one who infused us up a batch of homemade bacon vodka back in October 2008, she was interested in how the pros do it, and whether they could match her distilling skills. If nothing else, they’ve got an edge on her on design: the Bakon logo, a stylized impression of bacon meat/fat stripes, is strangely visually appealing. Yes, the name is yet another clever twist of terms that www.baconfreak.com has come to be known for, as they voyage to the farthest corners or “culinary connoisseurism” to makes food fun again! Yes, “suey” is the word that farmers use to call all their little piggies to come eat. So if it’s premium gourmet bacon being decadently drenched in the most seductively sensuous Swiss Chocolate, then how else would Bacon Freak go about calling its “Baconista” the herd to the trough than by switching the word “sueyets” for sweets? So is Bacon Flavored Seasoning better than Bacon Salt? Can Bacon Freak out-freak Vosges, or at least manage to lay more of a broadly obnoxious gender-stereotyping trip on an otherwise perfectly innocent confection? Which is better, something made in a professional distillery, or something Genevieve concocted by letting bacon sit in booze in her cellar? We considered it our duty to find out. Because bacon is not over, baby. Bacon will never die. The taste: Bacon Freak’s Bacon Flavored Seasoning is a little saltier and has a little bit more heat to it than J&B’s; more paprika, maybe. It also tastes marginally less like actual bacon. For fans of actual bacon, they’re both kind of a wash; for fans of actual salt, Bacon Freak’s is stronger and also less chunky and coarse. On the downside, Bacon Flavored Seasoning tastes more noticeably artificial and chemical. While it doesn’t come with J&B’s on-the-label guarantee that it’s certified vegetarian and kosher, the ingredients on the nutrition label do not actually feature meat in any way; like J&B’s, it’s a blend of salt, onion, garlic, MSG, paprika, and other, less organic-sounding stuff. Bacon Chocolate Sueyets, on the other hand, clearly contain actual bacon, in much larger quantities than the Vosges bacon bar. The Sueyets are irregular, clearly handmade discs of dark chocolate with significant chunks of simultaneously crispy/chewy bacon scattered within. The chocolate is rich and pungent, and so is the bacon, which actually, for a wonder, tastes more like bacon than like salt or liquid smoke. The tastes actually complement each other very well, and the blend of textures is appealing. Bakon vodka smells something like Band-Aids dipped in watered-down rubbing alcohol, except sharper. The smell alone deterred at least some of the potential tasters. The taste is bitter and burning—it’s vodka, after all—but with a vaguely meaty, vaguely sour undertone that’s more Slim Jim than vodka. Eventually, maybe a minute after ingestion, it develops a faint bacony aftertaste. It doesn’t have the rotting-fat flavor of Genevieve’s homemade bacon vodka, nor the visible fat floaters, though she was quick to point out that it did have the exact same urine color. Appetizing! In the plus column, while we didn’t much like it straight, it came with a recipe book for mixed drinks that consistently sound interesting, if not necessarily delicious. For instance, the “Swine Flu Shot: 1 part Bakon Vodka, 1 part Jaeger, 1 part Goldschlager.” Or the “Orange Bakon Bomb”: a float of Bakon Vodka and Orange Curacao dropped in a pint glass of Red Bull. Naturally, the Bakon people recommend trying Bakon in a Bloody Mary, so since we don’t have a fully stocked bar here in the office (the higher-ups get confused enough just seeing us all standing around in the middle of the day swilling limoncello and hibiscus tequila), we bought some V8 and made a half-assed stab at Bloody Bakons. Where to get them: Bakon just got a distribution deal via a New York company, and can now be ordered online. Sueyets have their own order page and now come in milk chocolate, too. Bacon Flavored Seasoning similarly can be found online.